Fishing over the past week has been great with some good reports and nice fish coming in. The coming long weekend is certainly set to fire with both lakes and rivers fishing well. 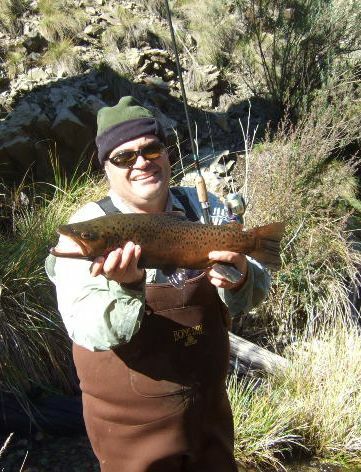 Rivers:- Have been very good overall with some nice browns and rainbows being taken in the Eucumbene and Thredbo rivers. Water levels have dropped and cleared but the fish are still on the go. Conditions were particularly cold and bitter on the weekend but the fishing was good for many. 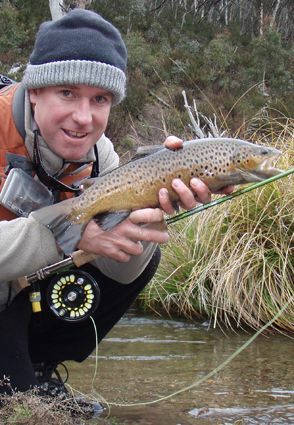 *Mark Gaal had a good couple of days on the Thredbo and Eucumbene rivers catching some very nice fish. Glo bugs and nymphs were the best patterns. *Got out for a quick fish myself last week and though didn't land anything of great size it was fun to catch and release a few fish on some globugs. All fish were sighted before casting. It was great dropping into your store as we do each year and spend some money with you. My brother & I were lucky to do a little fly fishing one week before the close. 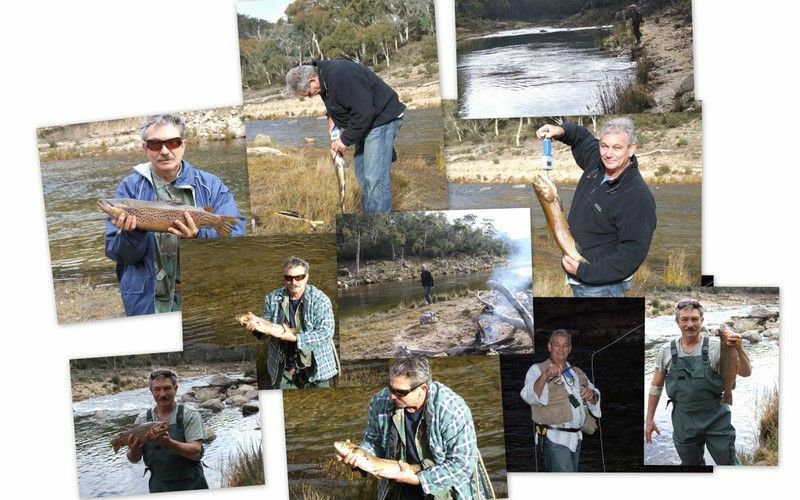 I enclosed a collage of our exciting 2 morning results Fly Fishing the Thredbo River. We caught & released over 8 fish between us, all around 50 to 64 cm except for one which was about 10 cm. We also got busted up a couple of times on 8.5 lb tippets- the one that got away? There are still some very good rainbows poking around during the day and provide plenty of fun when conditions allow. The edges are a bit sticky but with kilo-ish fish around worth the effort. Lake Jindabyne:- Jindabyne reports have been very good with some fish being polaroided already when the weather allows. With some good browns around the edges trolling larger minnows by Rebel, Strike Pro or Rapala will give you the chance at a real trophy. You can still run other smaller lures on on other lines to target the rainbows, but one big lure in the spread at this time of year is a great way to tangle with a once in a lifetime trout. Fished the Eucumbene River for a couple of hours on Saturday for 5 very fit rainbows on a sinking rapala. 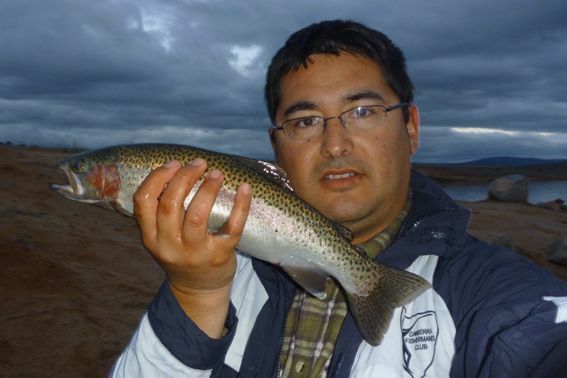 The rainbows were fairly easy to hook, although I could not tempt any browns. Rapala was a 7cm Countdown in rainbow trout colour. Dropped down to the lake in the afternoon around Angler's Reach hoping for a feed. Only got this brown on a soft plastic squidgy in rainbow trout colour. 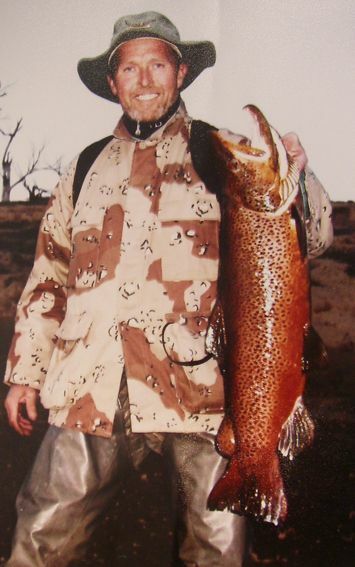 *Stan Konstantaris with one of the many fish he caught in the river drift rigging globugs on the weekend. A lot of fun on light spin gear. 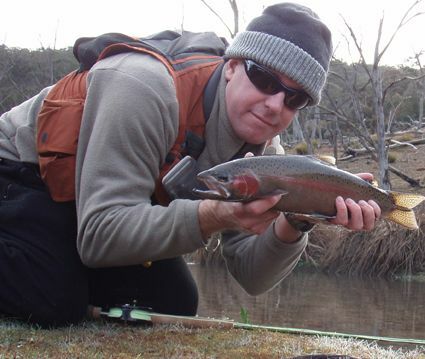 Jindabyne:- Has produced a few nice fish on the troll with minnows bsing the best lures. Vibes in the Rayza brand have been excellent as have the strike pro vibes. Fished on three colours of leadcore these have been very productive. *Nick, Jake, Otto, Francis, Kenny and Andre from the Sydney Game Fishing Club had a productive weekend troling the edges around the Dam wall and in front of the Caravan parks. Best fish were an atlantic salmon of 2.3kg, a 2.2kg brown, a 1.5kg brook trout and 1.5 kg rainbow. Best lures were Rapala minnows in rainbow trout and gold in the seven to nine centimetre size range. Flatlined and in close was the best method. Creel bay also produced a few though not as consistant as closer the township end of the lake. Headed to 7 gates Saturday 5th June for the night, got our first fish about 8 pm and both bagged out by 1 am. All fish were on fl orange and lime twist nuggets.. few big hits and dropped fish on bardi grubs.. cold night as expected.. all fish were of healthy size and weight. In Jindabyne reports have been better. Ive been trying new spots at Jindabyne hoping to find larger fish over the two months instead going to my usual spot at Kalkite. Ive been unsuccessful so I went back to Kalkite on Saturday between 4.30 and 7.00 pm and got two rainbows. One was caught on sherbert power bait and the other was a mix of an orangey-red gulp power bait and lime twist power bait (dont ask why, I picked a bit of one and mixed it with the other). The second fish cost me a bit of skin on my left hand and knee. I rebaited my rod just on dark and then moved to the next rod, as soon as I picked it up, the other rod went off and I thought I must have crossed the lines when I rebaited the first rod. When I realised it was a fish, in my excitement, I dropped my little LED torch, then tripped over some rocks on the bank and fell over. I had to land the fish without a torch but fortunately, I had a kamikaze trout that kept swimming into the bank. I could make out the ripples on the surface and it swam right up to my feet and I was able to scoop it up with the landing net.